This fish was mostly found throughout the Mekong Basin, Chao Phraya Basin, Malay Peninsula, Sumatra and Borneo, although it is now rare in the wild. Mature females are larger and more full bellied. A skittish mid-swimming fish. Can work in larger community tanks with larger fish, but nothing aggressive or fast swimming. Do not keep with much smaller fish nor with shy and delicate fish. Should be kept in groups of 4 or more, will be exceptionally skittish if kept alone. An omnivore, the Bala Shark is not a particularly finicky eater. Will accept flake/pellet foods, frozen/live foods such as bloodworm and tubifex, as well as vegetable-based foods. Needs a large long tank. 152.4-182.9cm (60-72") of swimming space is recommended to give this species ample room. Additionally well oxygenated water helps to enable this fish's swimming habits. The Bala shark will jump when startled as such they require a heavy and tight fitting tank hood to prevent injuries when jumping. To keep the fish from becoming startled their tank should be kept in a quiet environment, people merely walking past the tank can scare them. A large shoaling fish, can be quite skittish and requires company of it's own species to feel secure. Needs lots of lateral swimming space. This fish is quite distinctive and fairly common in pet stores. 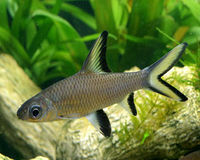 It has an iridescent long silver body with black-tipped and white fins. It is "shark"-like in appearance and swimming pattern. This fish is listed as endangered on the IUCN Red List and therefore if you see this fish available in aquatic stores you should enquire whether its farmed or wild caught. Wild caught fish should be avoided. This page was last edited on 13 December 2017, at 02:41.